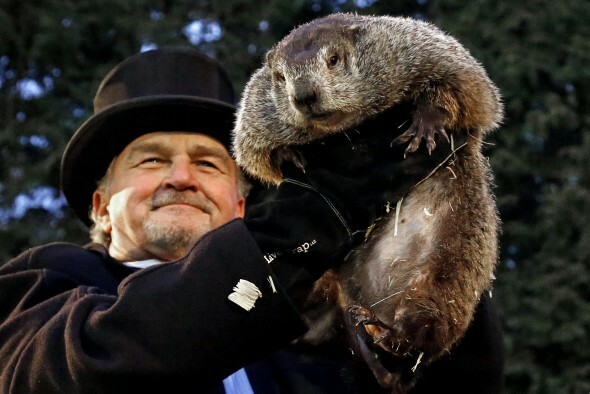 So today, on Groundhog Day, rodent meteorologist named Punxsutawney Phil saw his shadow, signaling 8 muore weeks of winter. Fret none, according to the history books, Phil, the famous groundhogs who lives in Pennsylvania has only been correct 18 out of 102 Times! Yikes! But we turn to him each time because of tradition. The first official Groundhog Day was celebrated on February 2, 1887 at Gobbler’s Knob in Punxsutawney, Pennsylvania. A select group of top hat and tuxedo-wearing individuals called the Inner Circle take care of Phil year-round. They’re a group of local volunteers who are responsible for carrying on the tradition of Groundhog Day. When Phil emerges from his burrow to make his prediction, he “speaks” to members of the Inner Circle in Groundhogese and tells them his forecast. The Inner Circle then translates for the rest of the world. The average groundhog lives to be between 6-8 years but Punxsutawney Phil is supposedly over 130 years old. He gets his longevity from drinking “groundhog punch” a secret elixir known only by members of the Inner Circle. One sip during the Groundhog Picnic every summer gives Phil an additional seven years of life. Punxsutawney Phil weighs around 20 pounds. The average groundhog weighs 12-15 pounds. Apparently “groundhog punch” is fattening. Phil lives in a library. Phil lives in “Groundhog Zoo,” a warm terrarium built into the Punxsutawney Memorial Library. Punxsutawney Phil can be seen from outside or from inside the Library. He shares the home with his wife Phyllis and a couple of other groundhogs. Phil gets lots of visitors. In the years following the 1993 release of the movie, “Groundhog Day” starring Bill Murray, crowds numbering as high as 40,000 have flocked to Gobbler’s Knob in Punxsutawney. Ironically, the movie was shot in Woodstock, Illinois. Phil’s full name is long…really long. Punxsutawney Phil’s full name is -Punxsutawney Phil, Seer of Seers, Sage of Sages, Prognosticator of Prognosticators and Weather Prophet Extraordinary.